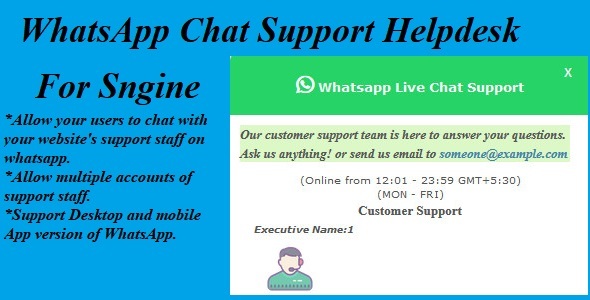 WhatsApp Chat Support Help-desk is a addon for Sngine which allow you to put live chat box on your website and visitors can chat with you or with your support staff via WhatsApp.This is very easy and effective method to offer quick support to your website’s users.This add-on is very useful to keep contact with your website users,help them to resolve their queries. Sngine is a Social Network Platform is the best way to create your own social website or online community. Allow your users to chat with your website’s support staff on whatsapp. Allow multiple accounts of support staff. Support Desktop and mobile app version of WhatsApp. Unlimited bandwidth because it uses WhatsApp server. Unlimited chat histrory because history save on WhatsApp server. Allow you or your staff members to chat with multiple users at same time.